Sea Change has a glorious hook. I knew I wanted to read it when I saw the words girl, kraken, fairy tale and adventure all together in the description. Also, that marvelous cover art didn’t hurt on first impression. It’s been so much fun to answer the weekly question of, ‘What are you reading right now?’ with, ‘A book about a girl who loves a kraken.’ I see friends’ eyes widen with disbelief and/or interest. Luckily, S.M. 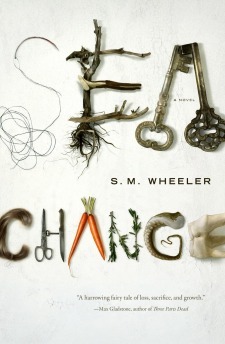 Wheeler’s fantastical prose lived up to that hook – Sea Change is an enchanting, disturbing, and altogether wonderful tale. Lilly has grown up lonely in a manor house by the sea. Her only friend is a kraken, Octavius. Just when her home life becomes such that leaving is her best option, Lilly finds that Octavius is missing. To get him back, she’ll have to go on a transformative journey that will test her will, her memories and her heart. In this twisted, beautifully-described tale, good doesn’t always win, everyone has a fault (or many), and surviving will take sacrifices, luck, and very hard work. The first thing I must tell you about Sea Change is that it is an adult fantasy. Yes, Lilly comes of age, but no, it is definitely not typical YA material. Second, it is very much a character-driven story, despite the journey that frames three-quarters of the book. Lilly is the main focus, though other characters join the narrative and show their many selves in different situations. I will also warn you that there is quite a lot of murder (attempted and otherwise). Sea Change teeters on the brink of dark fantasy, and it is all the lovelier for it. The story’s main strength is its dreamlike, lush description. Word pictures and fabulous similes clash with wrenching choices forced by pitiless antagonists. At the same time, Wheeler leaves the reader to infer many of the details, creating an aura of mystery and the perfect amount of distance for an atmospheric fantasy. In the midst of it all, Lilly is (mostly) honest with herself, even as she adapts as her adventure demands. Her deep and loving friendship for Octavius guides the narrative, and if there is something the reader is meant to take away from the tale, it may be that deep friendships will change a person forever and in ways unknown at the outset, and that fairy tales are sharper and harder in reality than they seem in the telling. Sea Change is a book to savor, and will be best appreciated by those who will take time to absorb the delicious descriptions and fairy tale connections. If that sounds like you, you can enter to win a copy of Sea Change on the author guest post. Recommended for: fans of Margo Lanagan’s The Brides of Rollrock Island or Neil Gaiman’s Stardust, and anyone with a taste for metaphor, fairy tale and magic. Fine print: I received an e-ARC of Sea Change for honest review from Tor (Macmillan) via NetGalley, and I did not receive any compensation for this post. I was wavering back and forth on this one, but if your descriptions of it as teetering on the edge of dark fantasy, and the beautiful prose hadn't already convinced me, your recommendations for fans of Brides and Stardust (two favorites of mine!) would have sealed the deal. Lovely review, I'm certainly going to be checking this one out!